Many of those calling for the troops to come home could more properly be called “anti-this-war.” “We never should have gone into Iraq,” the argument typically goes, “but World War II was a war we could all get behind.” It’s the tired “just war” argument rearing its ugly head, and Iraq just didn’t meet the criterion. While this may aptly describe the thinking of a certain part of the population – thanks to patriotic history textbooks and a popular culture that continually reinforces the myth of the “good war” – it fails to explain the increasing numbers that are now ready to pull the plug. More to the point, most Americans are simply “anti-losing-this-war.” As Alexander Cockburn explains in The Nation, people have turned against the war in Iraq because they “looked at the casualty figures and the newspaper headlines and drew the obvious conclusion that the war is a bust.” Had the invasion and occupation not been completely botched from the start, and if there was even some distant glimmer of hope that we might still “win” – however that is defined – many of the currently discontented would readily give their approval. 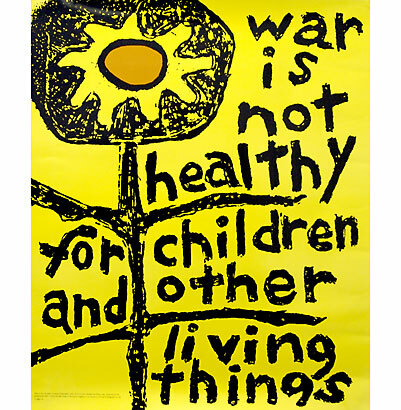 To be truly antiwar then means being opposed to all war, irrespective of the casus belli offered by those in power. It means complete rejection of the notion that violence has some role to play in bringing about a more just world, and actively resisting in ever more creative and daring ways what the New York Times last week called America’s “voracious war machine.” This critical work can take many forms, including: supporting GI resisters and the growing counter-recruitment movement, organizing against ROTC programs and war profiteers, not paying war taxes, engaging in nonviolent direct action, and educating others about peace and the power of nonviolence. Some might call this wide-eyed idealism. But if spending hundreds of billions euphemistically on “defense” every year, while 47 million Americans have no health insurance and billions of human beings live (and too often die) in desperate poverty around the world is what realism looks like, I’d choose idealism any day of the week.